For about 150 years, “ambitious” engineers and Unionists have dreamt of a fixed link between Ireland and Great Britain. Ultimately, a link between Great Britain and France was prioritised and eventually realised with the opening of the Channel Tunnel in 1994. There are plenty of good reasons why a fixed link hasn’t been taken forward seriously: the immense costs and engineering challenges involved (I return to that later), multiple adequate ferry services, the growth of cheap air travel and, Dublin aside, the lack of major population centres either side of the Irish Sea to generate traffic. But there are also arguments in favour: a roll-on, roll-off rail tunnel would be faster than the ferry, passengers would be able to travel directly from city centres (so it would be more convenient than air travel), it would shift freight traffic away from roads like the A55 and it would link Dublin – a major global city – with the rest of the European land transport network without interruption. Any such fixed crossing is more likely to be between Northern Ireland and Scotland for practical reasons – not necessarily because it would be easier or less expensive, but the shorter distance (19km compared to 90+km further south). Unionists in Northern Ireland would support a northern link as it would go some way to reducing the “otherness” that exists politically, culturally and economically between Northern Ireland and Great Britain. The problem with a “northern crossing” would be that it would likely require the construction of a high-speed rail line from presumably Glasgow (diverting around the Lockerbie area), through Dumfries and Galloway, Belfast and on to Dublin – a total of around 340km. So a northern crossing might be better suited to a road tunnel due to the shorter distance and because it would be much easier to tie in with the Irish motorway network (though it would require a major road scheme on the Scottish side). The most optimal crossing in terms of UK-Ireland would be direct to Dublin, and in that case it would have to start in Wales, with two major options. Firstly, a crossing from Pembrokeshire to County Wexford. Economically, it would probably be the most advantageous route for Wales, because it would necessitate either the construction of a high-speed rail link across south Wales (which could serve Cardiff & Swansea), or significant improvements/upgrades to the existing rail line from Cardiff and Swansea to Fishguard including, for example, a second Severn rail crossing. The Irish Sea crossing itself would have to be ~110km long, while if it were a high-speed rail link, about 420km of lines would need to be built from Bristol (and presumably on from London), though south Wales, under the Irish Sea, through Wexford and Wicklow and into Dublin from the south – potentially extending to Belfast in the future. The second option is a Holyhead-Dublin tunnel. It would need to be about 100km long. Additionally, if it were a high-speed rail link it would have to link to HS2 at Crewe and cross north Wales (about 150km of high-speed rail line) and also have a short (presumably tunnelled) connection to Dublin city centre at the Irish end. This depends on the underlying geology, the budget and the available technology. The Irish Sea varies from about 80m deep to up to 160m deep at the northern end (which makes a Scotland-Northern Ireland crossing more difficult). This is certainly “doable”, as the Seikan Tunnel between Honshu and Hokkaido in Japan is up to 240m below sea level at its lowest point. That’s the sort of depth that would be required if it were an undersea tunnel (a tunnel constructed below the sea floor). The construction methods would have to be similar to the Channel Tunnel (i.e. using a tunnel boring machine). Another option is an immersed tube tunnel, where segments are constructed on the surface then sunk to the sea floor, attached to other segments, any water pumped out and spoil used to cover the tunnel. It’s quicker and far more cost-effective than tunnel boring, but it may not be practical due to geology and topography of the Irish Sea floor. Also, the longest tunnel planned using this method (the Fehmarn Belt Link between Denmark and Germany) is only 18km long. A more radical and untested option is a submerged floating tunnel. Under this method, the tunnel would be constructed in segments (like an immersed tube), but instead of being sunk to the sea floor, would be anchored about half way down and kept in place by the Archimedes Principle. The technology hasn’t been used yet despite several proposals, but an Irish Sea Crossing may be a perfect testing ground. Another option would be a combined bridge-tunnel (like the Oresund Crossing between Sweden and Denmark or the soon-to-be-completed Macau-Hong Kong bridge). Under this option, there would be segments of a suspension bridge and immersed tube tunnel connecting artificial islands. It’s probably impractical for the Irish Sea due to water depth which makes it harder to build the islands. How much would an Irish Sea Tunnel cost? Who would pay for it? The only fixed link that’s had an estimate put to it was the Holyhead-Dublin tunnel, priced at £15billion following a throwaway mention in the Chartered Institute of Logistics & Transport’s (CILT) Vision 2035 report published in November 2014 (pdf). It’s not clear whether this £15billion figure price includes the costs of high-speed rail and road links to the tunnel. Based on HS2’s estimated £78.5million-per-km price tag (in 2015), an extension of HS2 from Crewe to Dublin via a tunnel (about 280km) would likely cost £22billion by itself. This is before counting unexpected additional costs, such as additional tunnelling (the Carneddau range in Conwy would probably have to be tunnelled under), extra bridges (a third/fourth crossing of the Menai Straight for a high-speed line) and links into the existing rail network (i.e. to enable a Dublin-Manchester service). Based on the estimated HS2 travel times and train speed (235 km/h), a London-Dublin journey would take about 2 hours 6 minutes non-stop (though likely to be longer if the tunnel has a speed restriction). That’s competitive with air travel once passport/baggage/customs controls and travel to and from the airport is included. Dublin-London is the second busiest air route in the world, so the passenger demand is certainly there and there’ll almost certainly be freight demand as well. An Irish Sea Crossing from Holyhead would have very little real benefit for Wales. We would still need to be party to any Treaty establishing the project and would be responsible for key maintenance aspects, but it would be mostly used by passengers travelling from the major English cities to Dublin and vice-versa as well as existing cross-Irish Sea freight; Wales would simply be a bit of greenery they travel through on the way. 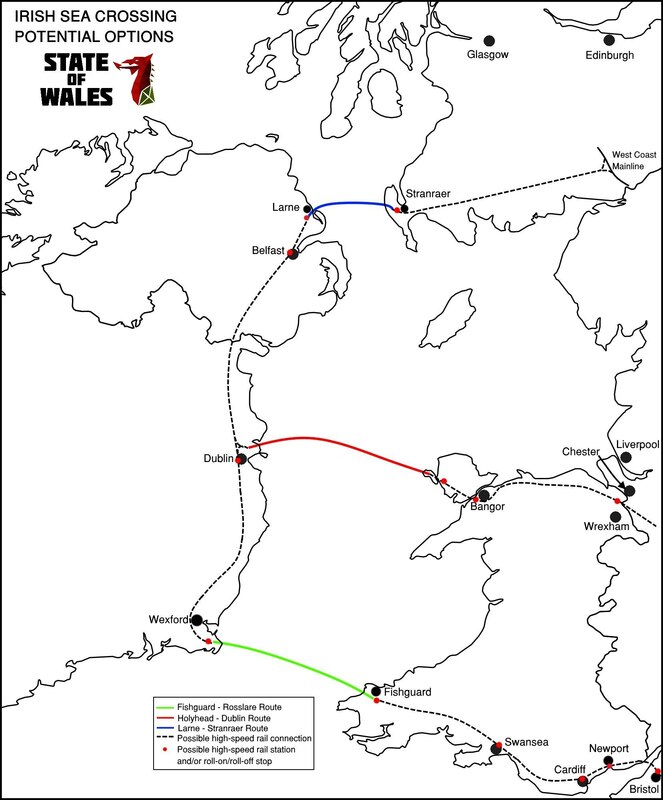 Unless a southern route was taken (so that a high-speed rail line serves Cardiff & Swansea) there would be little incentive for the Welsh Government to contribute a substantial amount towards the project – it would have to be borne by the Irish and English governments in the main, perhaps with some investment from the European Union (as it forms a core TEN-T transport corridor) and private investors. The Welsh Government could invest in a station to serve the Flintshire/Wrexham/Chester area (if a Holyhead-Dublin route were chose) and act as a major interchange for domestic HS2 services. Something similar could be built for Snowdonia too. If the Marches Line were upgraded, there would be potential for a Cardiff-Dublin rail service as well. Obviously, don’t count on taking a train to a Six Nations game at the Aviva Stadium anytime soon. This isn’t going to happen unless HS2 comes in way under cost, the cost of tunnelling also comes down and the EU sees fit to invest in infrastructure serving the UK post-Brexit. There are plenty of other infrastructure problems in Wales and the Republic of Ireland that need to be sorted before this can be seriously considered – but maybe it will be worth a full feasibility study at some point in the future. The End of the Engine?